This post will remain a sticky for the time being. Normal posts resume below. What do you think of Deck for the jailbroken iPhone? 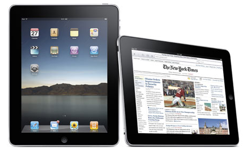 [From Hans] Another one from Forbes, 8 ways the iPad can help you earn and save money. "With Apple unveiling its new iPad today, even more consumers will likely be joining the “iPad revolution.” I’m not a techie by any means but I can tell you that the iPad has certainly changed my life in certain ways. It’s made accomplishing certain tasks both more efficient and more fun. So how can you bring some of that iPad magic to your financial life? (You didn’t really think it was just for playing Angry Birds did you?) Here are some things you can do while curled up on your couch with your iPad"
[From Hans] Interesting editorial over at Forbes. "My company sells applications. Just applications. Although we can be very dangerous, we do not specialize in infrastructure like hardware, networking or security. This is good because we can stay focused on the technology we know and be great with those programs. This is not so good because we have to rely on others to make sure our clients’ infrastructure is working correctly. And if a client’s infrastructure is not optimized, our applications look bad. And then we look bad. So over the past eighteen years of doing this in the Philadelphia area we’ve come across some great information technology people that have helped us succeed. Yes…geeks. These are the guys that probably spent most of their Saturday nights in high school doing lab experiments and playing Dungeons and Dragons with their other nerdy friends. Wait a second…that sounds pretty much like my Saturday nights in high school too." [From Peter Arts] Peter Arts sent me this great picture which he has taken and tweaked of the New York skyline, the Empire State Building to be precise. [From Hans] Good tip, how to install iPhoto on your first generation iPad. "It is of course true that many original iPad owners may be looking to upgrade this year, but for those are still happy with their two-year-old devices, there is light at the end of the tunnel, with a relatively simple little hack allowing iPhoto to be installed on their devices. As is always the case though, there is a downside to proceedings. For those that just want to forge ahead regardless, here’s what you’ll need to do…"
ENDS TONIGHT AT MIDNIGHT US PT. I'm in the mood for a throwaway, I will choose a PalmAddict reader at random to give a unlocked black iPhone 4S 16GB [or cash equivalent payable by paypal]. For a chance, send me a couple of lines on how you're using your mobile device whether it be for business or pleasure [remember tell me what mobile device it is in your user thought]. It is compulsory to give your user thought a title, not a boring "how I'm using my mobile device", something that relates to your user thought. Anyone not giving a title will not be entered. It's user thoughts only for this, no news snippets or website recommendations, no pleas, purely user thoughts on how you're using your mobile device. Notes HD for webOS looks an interesting app, it's reviewed by webosnation. "The built-in Memos app for webOS isn't all that great. We all know it. With a big 9.7-inch screen like that on the TouchPad, its even more unforgivable how basic it is and how little its been updated. If there's one good thing about the pitifulness of the TouchPad Memos app, it's that it has opened the door for several third-party developers to built the better notepad. One such developer is Inglorious Apps, who created the aptly titled and well-featured Notes HD." [From Hans] A iOS app for to help monitor diabetes. "Diabetics will be able to manage their condition with an Apple iPhone thanks to a device unveiled today. The £48 glucose monitor allows patients to check their blood sugar levels at any time using the phone. The iBGStar device, which attaches to an Apple iPhone or iPod touch, comes with a free Diabetes Manager App that makes it possible to store, track and analyse medical data." [From Stephen Trew] Perhaps the CEO of Motorola said the same thing about phones. Remember the first phone with iTunes? It was a Mototola phone. Look what Apple did afterwards, the brought out the iPhone. "It's been rumored for a while that Apple is struggling to land content deals for its much-anticipated "true" entry into the TV business, and CBS's CEO Les Moonves has offered some insight on why that might be. Speaking at the UCLA Entertainment Symposium in a conference attended by the Hollywood Reporter, Moonves said he turned down Steve Jobs personally over the offer of making CBS shows part of a subscription-based content package."